Weddings are extremely fun. For a musician, weddings generally include ceremony music (prelude – before the ceremony; processional – down the aisle, recessional – end of the ceremony), cocktail hour, and/or the reception. Clients often request a mix of instrumentals and vocals. Not only does Hawaiian music set an island mood, but the tradition includes many poetic love songs very well suited to wedding celebrations. 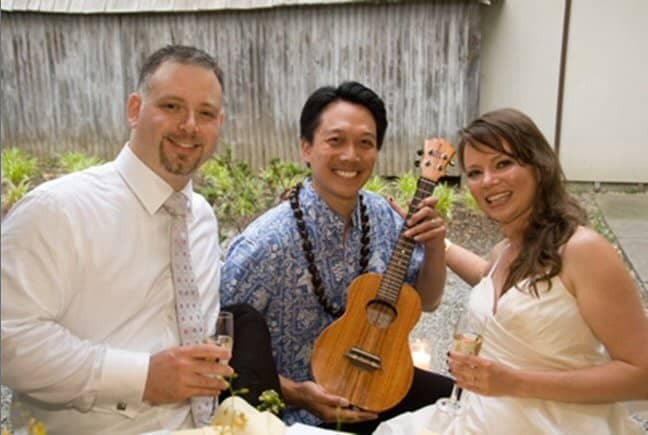 The ukulele and Hawaiian music can provide a celebratory and romantic ambiance for any wedding. It is a privilege to be an ukulele player in New York! Over the years, I have had the pleasure of meeting amazing brides and grooms as well as their family and friends. I enjoy seeing beautiful venues that I would otherwise never have seen from studio spaces in Manhattan to Long Island beaches. One recent wedding took place in North Salem, New York at the Hammond Museum. Tucked away in the woods is a hidden oasis, a Japanese Stroll Garden, that makes a unique backdrop for any event. I played music before the ceremony, specifically Somewhere Over the Rainbow/What a Wonderful World for the bride’s entrance. For a unique and fun recessional, a last minute special request of the bride and groom and a reflection of their personalities, I played a ukulele/vocal arrangement of Sweet Child O’ Mine by Guns N’ Roses. It was fun to see guests’ eyes light up as they recognized the tune in such a uniquely different state. For cocktail hour, I played Hawaiian slack key guitar, a mix of traditional and contemporary Hawaiian music, both laid back and upbeat. I think that you can see from the photos that it was a beautiful wedding, and it was an honor for me to be a part in it. Congrats to the newly married couple and their families! Looking for an ukulele player in New York? Andy has performed Israel “Braddah IZ” Kamawiwoʻole’s medley Somewhere Over the Rainbow/What a Wonderful World and other songs at wedding ceremonies, wedding cocktail hours and wedding receptions in New York, New Jersey, Pennsylvania, Connecticut and California. For booking information, please email. Looking for someone to play ukulele at my wedding during cocktail hour on August 17 2019.